This website's banner has a picture of the stained-glass window in the sanctuary. It was commisioned by our church for the millennium and funds were raised by the congregation. The artist was Sheenagh McKinlay who designed and constructed the window in her workshop in Bromley-by-Bow. Sheenagh doesn't paint the glass: she uses coloured glass in a mosaic fashion. There is always something new to see in the window, and, as with all art, each of us has our own interpretation. At the centre under the sky and over the oceans is the dove of peace and hope, beneath the rainbow that is God's promise forever. To the left is the Garden of Eden with the tree of life, the start of the journey for men and women, the beginning of our relationship with God. To the right is the hill of Calvary topped by the cross on which Jesus died.This is the transit point, where our journey on earth leads to our life with God forever. From the Garden of Eden, across the rough seas with God's help, protection and promise to the Glory of Heaven. On our roof is Giusseppe Lund's metalwork sculpture of a cross and a fish, both of which were Christian symbols used in those early days of persecution to signify one's faith. The five letters which made up the Greek word for fish (I-CH-TH-U-S) were also the initial letters of the Greek words for JESUS CHRIST, GOD'S SON, SAVIOUR, and therefore also a declaration of belief. 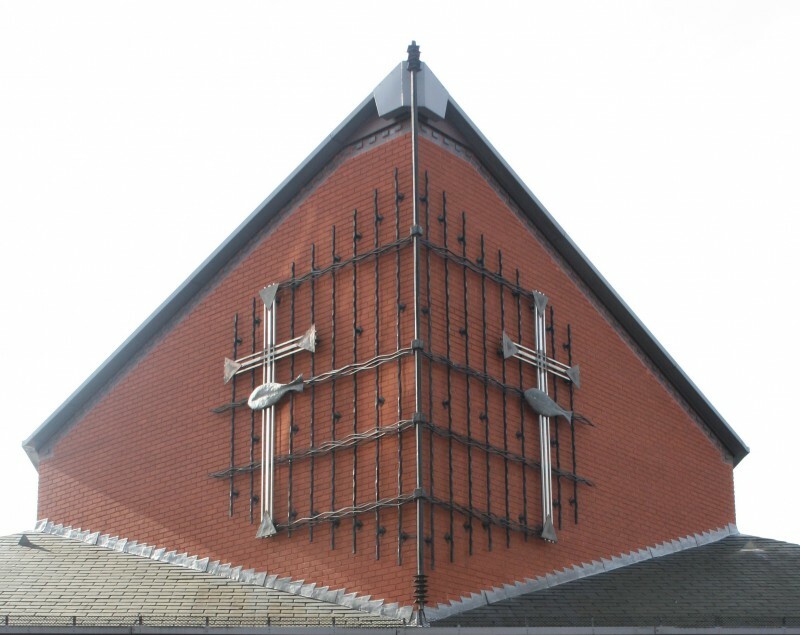 This particular sculpture is an adaptation of the Cross and Fish as used by the URC for its logo above.